Interested in the global context? 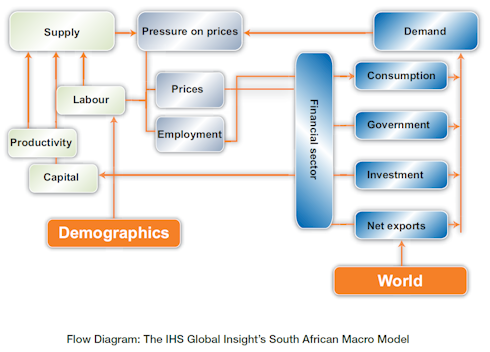 IHS recognises the need for a comprehensive understanding of the South African and global economies. EconoInsight provides economic forecasts and analyses spanning the short-, medium-, and long-term prospects for South Africa, sub-Saharan Africa, and the world. Regular reports, a comprehensive data repository, and access to our team of specialised economists will help interpret how the economy impacts your organisation. EconoInsight provides a coherent framework for interpretation, and ensures that the analysis and forecasts are consistent with our global forecasts for over 200 economies. The combination of experienced analysts, sophisticated economic models, and consistent information will give you a dependable platform from which to make effective business decisions. EconoInsight will help free up your time and resources so you can focus on your core business activities. IHS is broadly recognized as an undisputed leader in economic analysis and forecasting. With hundreds of analysts and economists based in over 30 countries, we provide the most comprehensive economic and financial coverage of countries, regions, and industries available from any source. Our local team of analysts and economists, based in Pretoria, is a leading provider of analysis and forecasts on the South African economy. We have experience in applying our skills to business problems in the real world, and we can provide strategic advice to large multinationals, small high-growth businesses, government, and non-governmental organisations. Covering the world, the sub-Saharan Africa region, and the economy of South Africa, this service provides clients with a unique combination of a global view and the local perspective to assist in making key investment and business decisions. All EconoInsight data and reports are available to service subscribers via our innovative Internet-based delivery mechanism. Through the Internet, we can save you time by offering fast, easy, and accurate access to the information you need. Our specialists are available for on-site presentations on the economic outlook for South Africa and its potential impact on your organisation.